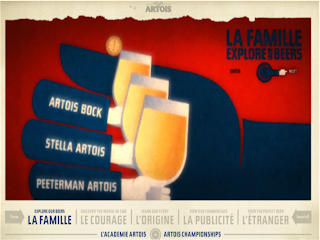 I've just seen the new 'Artois' site for the UK. I like it - nice visuals and music - and it also lets you see some of the classic old ads (Jean de Florette style), and play an interactive beer pouring game. My only real criticism would be the lack of deep linking, and the opeing of a new window for every page. If it allowed deep linking, I could post a direct link to the ads, but I can't, so you'll have to find your own way there! UPDATE - ok - the penny's finally dropped. Artois can't legally deep link into the site as visitors have to go through age verification before they see the content. So no real criticisms then, but what a bummer for usability!